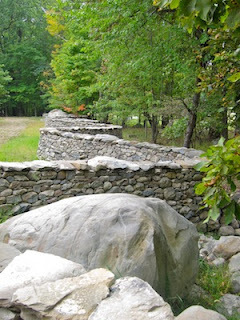 I have mentioned several times that I have been working on some stone walls. The weather has been absolutely perfect for several days (low humidity, cool temps and black flies are gone!) so I have really been spending as many hours per day as my back will allow. You need to understand that dry stonewall building is a passion of mine. I discovered it 30 years ago and have been building them off and on for years since. I am currently rebuilding an old farm wall that meanders along our hilltop. I have been working on this particular project for over three years and it is a long wall! This is what the old farm wall looks like when I begin. Calling it a wall is a generous description. 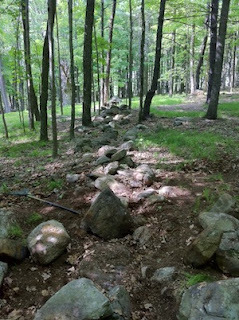 In reality it is a stone pile lining what was a field about 80 years ago. I have to completely disassemble what is there and then try to use the rock to create something with a little more order. This is challenging because I am using existing rock, not rock that I have selected for its appropriateness. This is what i looks like today looking back along the distance that I have been working on this spring. I am not done yet - about 50 feet to go. Hopefully this section will be finished this year. Then I can start on my Andy Goldsworthy inspired wall! 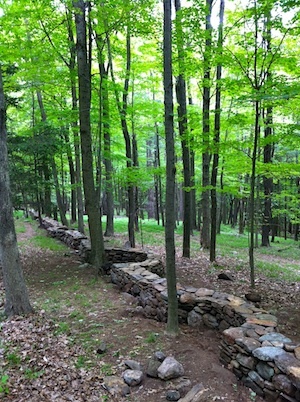 We visit Storm King in New York State regularly just to see the Andy Goldsworthy walls. Here are a few photos I have taken. They are incredibly inspiring. There are several books available about the stone work of Andy Goldsworthy. I recommend them all. I'm so glad I stumbled upon this post of yours from 2011. I had never heard of Andy Goldsworthy before and now I've added your 4 recommendations to my Amazon Wish List. Both you and him are extremely inspiring! I'm impressed because you're a woman who builds stone walls and taught yourself how to do so AND because generally I think of stonework being done by men and you've suddenly changed that. I am a woman, too, so I now feel quite empowered by your work in the hopes that I can create some beautiful natural structures on our property in Virginia. I've always been drawn to rock and stone but never quite sure how to incorporate it successfully into landscaping, plus my husband worries that it will draw snakes out. Do you ever find snakes to be much of a problem where you live? Also, do you mind sharing how you taught yourself this skill? Was it trial and error, a particular book or manual, or a combination thereof? I would be especially grateful for any direction you could point me in. Thank you very much for your wonderful blog....may you continue it for a long time to come! Vickie, Thank you for taking the time to write. I have been building stone walls for 35 years and find it addicting once I get one started. Over the years I have had to reduce the size of the largest rocks I move, or keep them on the bottom. There are books on the topic although I used none. I just went at it. A search on Amazon will show many, and there are directions on line as well. 1. I do dig down about 1 foot and start building, I don't go below frostline and fill with crushed stone. The wall does move with time but that adds to the character. 2. I always watch for seams - where 2 rocks meet and try to never put 1 seam directly above the other. The goal is always to stagger the seams. The saying is 2 rocks over 1, 1 over two. 3. You want the face of the wall to lean in toward the center of a freestanding wall and into the hillside of a retaining wall. The wall will get narrower as you go up. And the weight of each rock should make it want to slide inward. Then, as the wall shifts with time, it will tend to shift into to its center and hold itself up. 4. Cap rocks are golden. A cap rock has weight, size and good fronts. It will be the row of rocks that top off the wall. They are rare and so don't be tempted to use them lower down. Save those top rocks for the top row. 5. I always build along an angle. Start at one end and work to build the end but keep adding to the length. Try to always place a rock up against the finished end. Don't place a rock in the middle with both sides open even if it fits very well. That means you will have to find rocks to fit in pinch points at some time and that is much harder. Always build up to the finished end. If you work at an angle, you can often roll bigger rocks up the angle. 6. I seldom split or chisel rocks except for the cap row and then I do much more fussing to get a better fit. 7. Don't do your first wall in the most visible location. Practice in an out of the way space as you learn. Rock wall building has been wonderful therapy and exercise, and has added much beauty to our land. Give it a try, and be sure to send me photos!